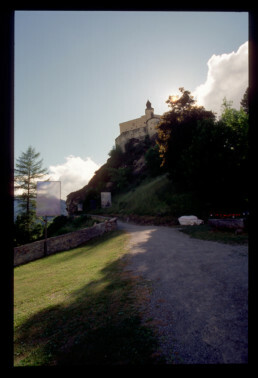 aufdemwegzumschloss has been originally displayed in the garden of the Tarasp Castle. 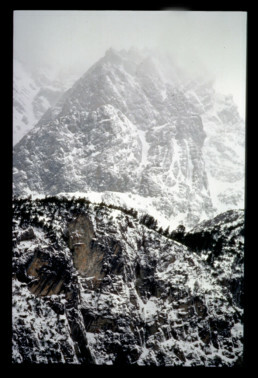 A number of 12 expressive colour photographs were displayed along the way, revealing my personal views on the impressive Bergries. 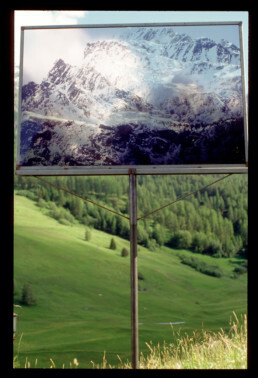 The photographs were taken during winter time and later exhibited outdoors, with the sky and the same mountains in summer as a backdrop. The Tarasp Castle, dating back to the 11th century, stands majestically on a hundred-meter-high rock above the landscape and Lake Taras. It is the ideal setting for the powerful colour photographs that are mounted on 1.20 x 1.80 large transparent panels. 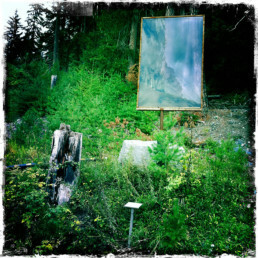 To each picture I have assigned a sentence from the poem “The Alps” – an ode to the mountains written by the famous Bernese scholar Albrecht von Haller. 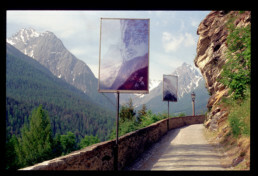 Inkjet prints, variable dimensions, 2002.